In a large mixing bowl, mix the yeast in with 4 cups of the flour. I use my Kitchenaid mixmaster. Make a well in this flour mixture, add the eggs, sugar, oil, and salt. Using a mixing spoon or the dough hook of your mixer, stir to blend. I use the #2 setting on my mixer, gradually adding in the water, one cup at a time. Be sure to stop the beater and scrape down the edges. Blend well and add the remaining flour. 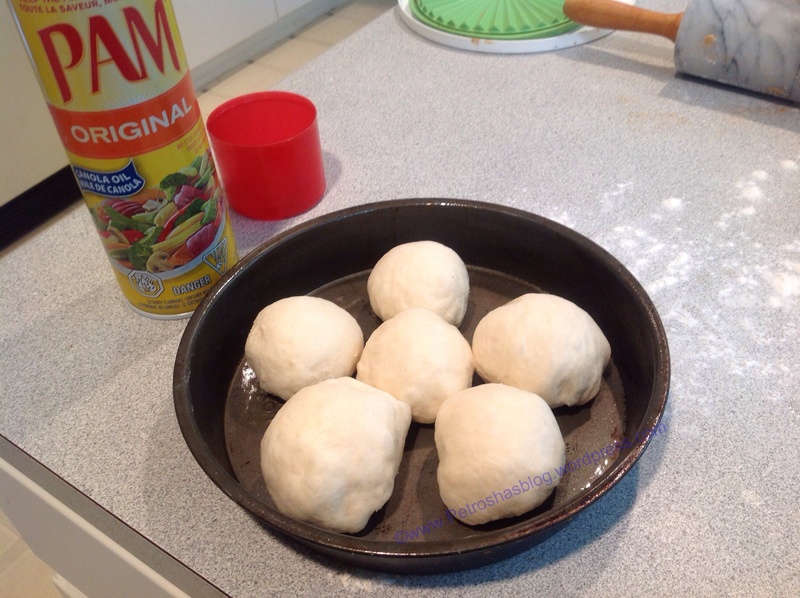 The dough will be soft and pull away from the edges of the bowl. This may take up to 10 minutes of kneading. Turn out onto your counter (lightly floured) knead a couple of more times before putting into another lightly oiled mixing bowl. Flip the dough over to coat it a bit with the oil that’s in the bowl. Cover with a tea towel and let rise for 15 minutes. I use the bread proof setting (100F) on the stove. Punch the dough down and let it rise again for 15 more minutes. When the 30 minutes of rising time has passed, the dough will have risen to the top of the bowl, doubled in size. Turn it out on your lightly floured counter, and divide it. When you are making the buns, roll into a log, and cut off 2 inch pieces (or larger if you like) and form and place into a greased pan (I spray with Pam). Cover and let rise for 1 hour. This recipe will at least 5 dozen buns, depending again on what size you prefer. For a dozen buns: you need to peel and mince about 5 – 8 raw cloves. But if you do not want a strong garlic taste, reduce the number of cloves. I have also roasted my heads of garlic and squeezed out the garlic cloves and mixed these with the cream. It gives a sweeter garlic taste, and not as strong. I use thick cream, but if watching the calories, you can use half and half cream/cereal cream.